to booth or not to booth, what was the question? – RV Cheaper! October 7, 2015 October 31, 2015 RV Cheaper! to booth or not to booth, what was the question? Our popup tent trailer had booth seating, I grew up with campers having booth seating. 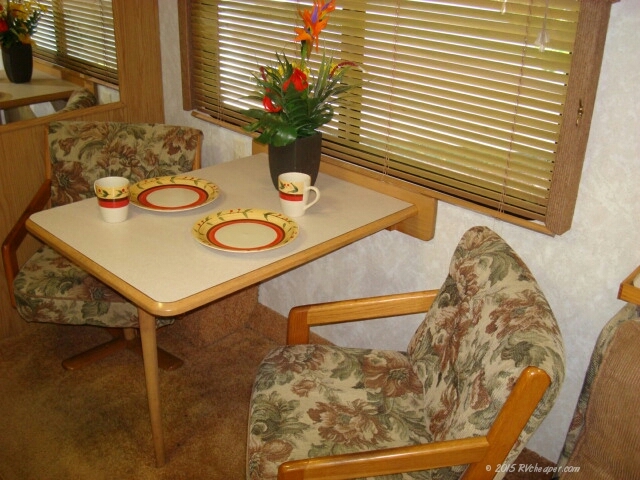 When looking at motorhomes we didn’t really didn’t even give dinette seating very much thought. When I spotted our Bounder I was surprised this one only had two swivel seats and a small table, most RV’s including other Bounders had booths. Many people will want that booth since that gains you another bed, but hey it’s only two of us and will be fine for a few years. When we go to a newer RV, I would like to have slide outs and a hide a bed couch would be better than the one guest jack-knife couch we have now. Once we got acquainted with the RV we found out there’s an 18″ leaf (under the bed) to extend the table so all we need is 2-3 padded folding chairs if we ever needed to seat 4-5 inside at the table. Having the swivel chairs has made both chairs a great place to watch TV, just hang out during cold or wet weather and made the table a decent telecommute workstation on a couple trips. So another unplanned feature on this RV has accidentally become a must-have when we move up to a newer RV. Previous basements, you can take it with you! Our fifth wheel has a booth and we love the storage space it affords us, Steve. But here is an interesting twist: we disabled the sleeping feature. The full width table made it too difficult to get in and out of the booth, so I made a narrower table top. We did save the old top for resale. Great point, I forgot about all the extra storage under those seats!